TEA BENEFIT Black tea has been known to expand the airways, thus making breathing easier for those suffering from asthma. The tea can destroy viruses in your mouth and also help prevent diarrhea, pneumonia, cystitis, and skin infections. It is believed that black tea can help delay the aging process hence, the tea extract is being used in various anti aging creams and lotions. DESCRIPTION The Second Flush is also one of the signature flushes of Darjeeling and the teas are sought after by buyers far and wide. This tea is made in the month of June and is fired at a high temperature. 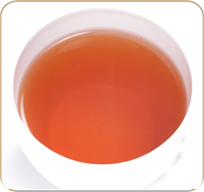 The muscatel aroma which Darjeeling teas are prized for, comes across clearly in the full bodied and well rounded cup.